Blood transfusion service (BTS) is an integral part of modern medicine without which efficient medical care is impossible. The aim of BTS should be to provide effective blood and blood products, which are as safe as possible and adequate to meet patients' need. Whole blood (WB) is a mixture of red cells, white cells, and platelets suspended in plasma. As different blood components have different relative densities, sedimentation rate and size they can be separated when centrifugal force is applied. Each blood component is used for different indication; thus, the component separation has increased the utility of one WB unit. Advance in medical technology demands more and more provision of safe blood for the effective management of patients. To deal with the ever increasing demand and supply of blood and its components in resource-constraint settings such as ours, more stringent criteria should be applied for blood donations and for proper utilization of blood. The rate of discarded blood components or “wastage rate” is one of those indicators and has been listed third among the ten quality indicators recommended by National Accreditation Board for Hospitals and Healthcare providers. It has been estimated that one-third of all patients admitted to Intensive Care Unit in the developed world receive a blood transfusion. Much of medical and surgical specialties depend on the steady supply of blood from voluntary, nonremunerated, healthy, and low-risk donors.,,, To overcome demand and supply gap, the performance of BTS can be increased either by increasing the level of resources used in the collection and production of blood components or by utilizing existing resources more efficiently. Hence, each unit of blood is precious and should be utilized judiciously with minimal wasting. By analyzing the data and the reasons for discard, the BTS can develop plans to improve performance through education and training of staff and introducing new measures to minimize the number of discarded blood to a reasonable rate. This can help in formulating proper guidelines for donor screening, component preparation, and storage. Protocols for minimizing the wastage of blood and components should be formed in each blood bank to save human and financial resources. The present study was designed to analyze the various reasons for the discard of WB and blood components in a blood bank attached to a tertiary care setup. It is also intended to suggest various possible strategies for optimum utilization of blood and reduction in its wastage. To introduce possible strategies for minimizing blood wastage and to observe and compare the discard rate after the implementation of strategies. The study was carried out in the blood bank of Guru Gobind Singh Govt. Hospital, Shri M PShah Govt. Medical College, Jamnagar in Western India over a period of 36 months from January 2014 to December 2016. It was a retrospective study. The present study includes blood units discarded for different reasons, which include transfusion transmitted infection (TTI) positivity, expired, suboptimal volume, leakage, clotted, hemolyzed, contamination of RBCs, not utilize after issue, lipemic and icteric blood units discarded during the study period over 36 months in present institution. Blood components such as packed RBC (PRBC), platelet concentrate (PC), and fresh frozen plasma (FFP) were prepared regularly from 350/450 ml blood bags under all aseptic conditions according to (FDA) Food and Drug Administration guidelines as per demand and workforce available in the blood bank. (1) PC and FFP (RBC contamination: <0.5 ml), (2) WB units of volume 350/450 ± 10%, and (3) FFP volume ≥200 ml. (As per National Accreditation Board for Hospitals and Healthcare Providers (NABH) guidelines). Data were collected after obtaining informed consent and ethical clearance before the study from local authority and institute, respectively. It was collected from the blood bank database system using Easy Software and Microsoft Excel 2007 database sheet for analyzing the results for calculation of percentage and Chi-square test. Blood units, included for data analysis during this period, were discarded for different reasons. The discard policy was followed as per the norms mentioned in standard operating procedures made by blood bank under NACO guidelines. Pearson Chi-square test was applied to calculate association between different variables with P value set as significant when <0.05. Discard rate = total number of blood or components discarded/total number of blood or components prepared × 100. 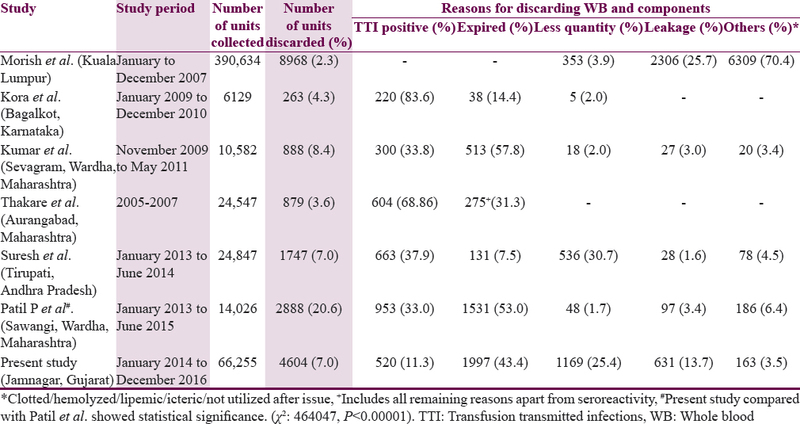 Discard rate for TTI positive units = total number of blood or components discarded due to TTI positivity/total number of units collected (for WB) × 100. It was observed that 29,914 (45.15%) units were collected from various voluntary donors in blood donation camps and 36,341 (54.85%) units from in-house donors both voluntary and replacement making a total of 66,255 units. Out of total units collected, 64,155 were male and 2100 were female. 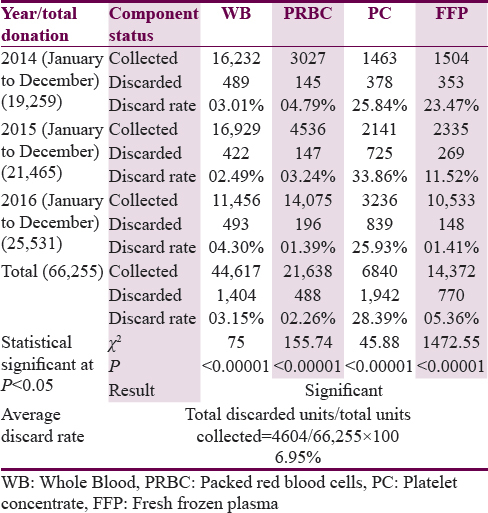 During the study period, 66,255 blood units were collected, of which 44,617 were WB, of the remaining blood units following components such as 21,638 PRBC, 6,840 PC, and 14,372 FFP were prepared. A total number of WB and components discarded due to various reasons and average discard rates with statistical significance are shown in [Table 1]. It was observed that the average discard rate was 6.95%, of which the discard rate for WB, PRBC, PC, FFP is 3.15% (1,404/44,617), 2.26% (488/21,638), 28.39% (1,942/6,840), and 5.36% (770/14,372), respectively. Total units of WB and its components discarded due to TTI positivity were 0.78% (520/66,255), date of expiry 3.01% (1,997/66,255), and other reasons such as suboptimal volume 1.76% (1,169/66,255), leakage 0.95% (631/66,255), clotted/hemolyzed 0.15% (100/66,255), not utilized after issue 0.05% (34/66,255), RBC contamination in PC and FFP 0.02% (15/66,255), and lipemic/icteric 0.02% (14/66,255); all these reasons are shown in Chart 1 as bar diagram. Out of 4,604 total discarded units, outdated units 43.4% (1,997/4,604), suboptimal volume collected 25.4% (1,169/4,604), leakage units 13.7% (631/4,604), and TTI positive units 11.3% (520/4,604) were most common among others. The units discarded due to date of expiry are shown in [Table 2]. The overall prevalence of HIV, HBV, HCV, and syphilis for WB as well as components was 0.09%, 0.55%, 0.07%, and 0.07%, respectively. Among seroreactive units, hepatitis B surface Ag positivity was the most common. None of the units tested were detected positive for malaria parasite. A comparison of data from the present study with various published studies is shown in [Table 3]. Blood transfusion is an essential part of modern-day health care. The need for blood and blood components is presently increasing due to improved and accurate diagnosis of complex diseases requiring transfusion, emergence of newer treatment modalities, and due to increased number of aging population with increased blood needs. Proper blood management at blood bank will reduce unnecessary wastage of blood and blood components. The self-audit of WB and blood components discarded over a period of time gives an idea about various reasons of discard. The present study showed that average 6.95% (4,604/66,255) blood units were discarded. The average discard rate in the studies by Morish et al., Kora et al., Kumar et al., Thakare et al., Suresh et al., Patil et al., Bobde et al., Sharma et al., Ghaflez et al., and Deb et al. were 2.3%, 4.3%, 8.4%, 3.6%, 7.0%, 22.45%, 6.63%, 8.69%, 12.0%, and 14.61%, respectively. Discard rate for WB in the present study was 3.15% (1,404/44,617) which was slightly lower than quoted by Suresh et al. (5.7%), Bobde et al. (6.63%), and Sharma et al. (4.46%). The most common reason for discard of WB was suboptimal volume collected which was 19.0% (875/4,604) of total wastage, followed by TTI positive 8.6% (396/4,604), clotted/hemolyzed 1.3% (61/4,604), expiry 0.65% (30/4,604), and other reasons 0.9% (42/4,604). Other reasons for wastage of WB included leakage, not utilized after issue, and lipemic/icteric, of which leakage 0.8% (35/4,604) was the most common cause. Main reasons for less quantity of blood were phlebotomy failure such as collapse of vein and acute donor reaction such as uneasiness, vomiting, perspiration, hematoma formation, and fainting during donation. This can be resolved by the selection of healthy donors with training and motivation of blood bank staff. Another reason for clotted and low volume may be due to using uncalibrated blood collection monitor and spring balance, thus making it unable to measure accurately the volume of blood in the bag. Discard rate for PRBC in the present study was 2.26% (488/21,638) which was lower than quoted by Suresh et al. (3.3%), Sharma et al. (3.2%) and similar to Bobde et al. (2.0%). The most common reason for discard of PRBC was suboptimal volume 6.1% (282/4,604) of total wastage, followed by TTI positive 2.7% (124/4,604), clotted/hemolyzed 0.8% (39/4,604), date of expiry 0.5% (24/4,604), and other reasons 0.4% (19/4,604). Main reason for the suboptimal volume of PRBC was aliquots (pediatric transfer bags) issued to thalassemia and pediatric patients. 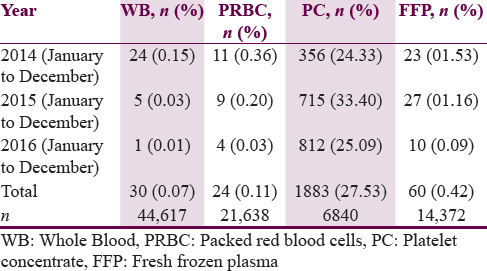 In the present study, [Table 1] showed that, in 2014 and 2015, discard rate of PRBC was higher than WB. Proper stock inventory and preparation of aliquots as per demand with aseptic precaution prevent the discard rate of PRBC due to suboptimal volume and that was achieved in 2016. PC was the most common component discarded during the study period. The average discard rate for PC was 28.39% (1,942/6,840) which was higher than Bobde et al. (26.2%), lower than Ghaflez et al. (58.1%), and Sharma et al. (43.6%). The most common reason for discard of PC among other components was date of expiry 40.8% (1,883/4,604), followed by TTI positive units 0.8% (35/4,604), not utilized after issued 0.24% (11/4,604), and contamination of RBCs 0.2% (9/4,604). High discard rate of PC was because of short shelf life of 5 days. Average discard rate for FFP in the present study was 5.36% (770/14,372) lower than Bobde et al. (7.6%) and Sharma et al. (6.2%). The most common reason for discard of FFP was leakage 12.6% (580/4,604), followed by TTI positive units 1.93% (89/4,604), date of expiry 1.3% (60/4,604), and other reasons 0.9% (41/4,604). Leakage was the most common cause of wastage of FFP which can be minimized by putting FFP units in a cardboard or polystyrene protective container that minimizes the risk of breakage of product during storage, handling, and transportation. 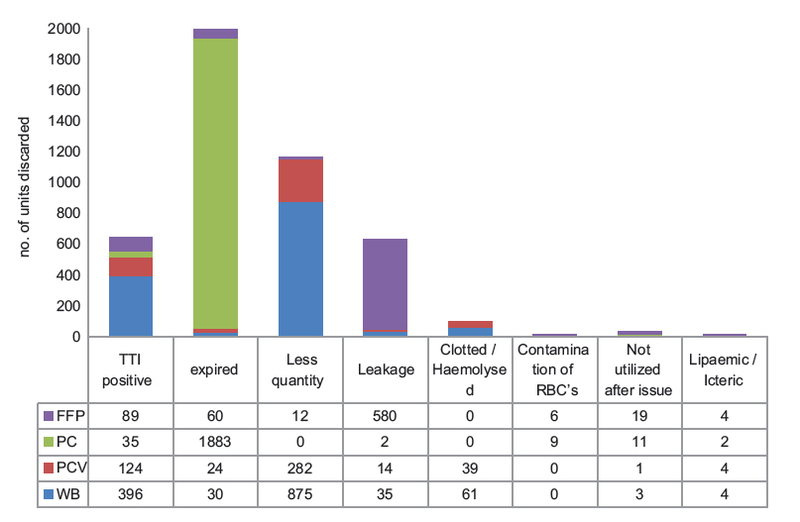 Other reasons of discard comprised of not utilized after issue, suboptimal volume, lipemic/icteric plasma, and RBC contamination; of which not utilized after issue 0.4% (19/4,604) was most common in the present study. Reasons of failure to utilize after issue were death of patients, transfer of patients to higher center, wrong product demanded, and an excess number of units ordered. The suboptimal volume and RBC contamination can be decreased by technical expertise in component preparation. The lipemic discards can be minimized by proper donor questioning regarding their interval between donation and time of the last meal. The shelf life of platelet is 5 days. Hence, their chance of expiry due to nonutilization was highest among blood components. In the present study, if the data of PC due to expiry (1,883 units) were excluded, the total discard rate found was 4.11% (2,721/66,255). The wastage of PC can be reduced by preparing it as per the requirement, urgency, and increased use of apheresis technique. In the present study, the average discard rate of PC due to expiry was 27.53% (1,883/6,840) [Table 2]. The average rate of discard of PRBC and WB was 2.26% and 3.15%, respectively. The storage period of PRBC is 42 days when it contains Saline-Adenine-Glucose-Mannitol (SAG-M) as a preservative; for WB, it is 35 days at temperature of 2-6°c and FFP was stored for 1 year at −30°C or below. The reason for expiry of PRBC, WB, and FFP was due to failure in proper implementation of first-in- first-out (FIFO) policy. This can be prevented through continuous monitoring and proper implementation of FIFO policy with maintaining stock inventory on a regular basis. In the present study, 0.05% (34/66,255) blood was discarded due to nonutilization after issue. Sensitization of doctors and residents was done regarding indication and use of blood and its components, and they were instructed to send back units not utilized after issue within 15–30 min to the blood bank maintaining cold chain and sterile condition. WB, PRBC, and PC were taken back to inventory if returned back within 15–30 min (provided cold chain and sterile condition maintained). FFP was taken back inventory if returned within 15–30 min of issue and was stored at 1–4°C. The same was used within 24 h of return. In the present study, over 3-year data (2014–2016) were collected and overall discard rate of component was 7.08% (1,365/19,259), 7.28% (1,563/21,465), and 6.56% (1,676/25,531), respectively. It can be concluded that significant reduction in discard rate (P = 0.0065, χ2 = 10) could be achieved through proper predonation history taking and counseling, technical expertise in phlebotomy, and component preparation with proper handling of blood units. Sensitization of blood consumers about proper transfusion methods added to reduce the discard rate. Practice of sending FFP for fractionation started in mid-2015 further added in reducing discard rate. Hence, the improvement in transfusion practice was achieved by proper policymaking and its implementation year by year. Blood being an irreplaceable resource needs to be proper utilized and to minimize wastage of blood there should be proper implementation of blood transfusion policies and coordination between hospital and blood bank staff. Continued medical education for technical staff to maintain self-audit, follow quality indicators of processing and preparation of blood components, and to monitor the rational use of blood and its components can review the blood management system. World Health Organization. Quality System for Blood Safety: Introductory Module Guidelines and Practice. Geneva: WHO; 2002. p. 65-75. World Health Organization. Recommendations. Developing a National Policy and Guidelines on the Clinical use of Blood. Geneva: WHO; 2009. Hardwick J. Blood processing: Introduction to blood transfusion technology. ISBT Sci Ser. 2008;3:148-76. Newman B. Blood donor suitability and donation complications. Handbook of Blood Banking and Transfusion Medicine. 2006. p. 27-35. Accreditation Standards on Blood Banks/Blood Centers and Transfusion Services. National Accreditation Board for Hospitals and Healthcare Providers. 2nd ed. New Delhi: Quality Council of India; 2013. p. 51-2. Saxena S, Weiner JM, Rabinowitz A, Fridey J, Shulman IA, Carmel R. Transfusion practice in medical patients. Arch Intern Med 1993;153:2575-80. Custer B, Johnson ES, Sullivan SD, Hazlet TK, Ramsey SD, Murphy EL, et al. Community blood supply model: Development of a new model to assess the safety, sufficiency, and cost of the blood supply. Med Decis Making 2005;25:571-82. Goodnough LT, Shander A, Brecher ME. Transfusion medicine: Looking to the future. Lancet 2003;361:161-9. Pitocco C, Sexton TR. Alleviating blood shortages in a resource-constrained environment. Transfusion 2005;45:1118-26. Morish M, Ayob Y, Naim N, Salman H, Muhamad NA, Yusoff NM, et al. Quality indicators for discarding blood in the national blood center, Kuala Lumpur. Asian J Transfus Sci 2012;6:19-23. Saran RK. Transfusion Medicine Technical Manual. 2nd ed. New Delhi: Drugs Controller General, India. Directorate General of Health Services, Govt. of India; 2003. Patil P, Bhake A, Hiwale K. Analysis of discard of whole blood and its components with suggested possible strategies to reduce it. Int J Res Med Sci 2016;4:477-81. World Health Organization. Quality systems for blood safety: Introductory module guidelines and principles for safe blood transfusion practice. Geneva: World Health Organization; 2002. p. 65-75. Kora SA, Kulkarni K. Blood wastage in a blood bank in an analysis of donor rural Karnataka. J Clin Diagn Res 2011;5:1393-6. Kumar A, Sharma SM, Ingole NS, Gangane N. Analysis of reasons for discarding blood and blood components in a blood bank of tertiary care hospital in central India: A prospective study. Int J Med Public Health 2014;4:72-4. Thakare MM, Dixit JV, Goel NK. Reasons for discarding blood from blood bank of government medical college, Aurangabad. Asian J Transfus Sci 2011;5:59-60. Suresh B, Sreedhar Babu KV, Arun R, Chandramouli P, Jothibai DS. Reasons for discarding whole blood and its components in a tertiary care teaching hospital blood bank in South India. J Clin Sci Res 2015;4:213-9. Bobde V, Parate S, Kumbhalkar D. Analysis of discard of whole blood and blood components in government hospital blood bank in central India. J Evid Based Med Healthc 2015;2:1215-9. Sharma N, Kaushik S, Kumar R. Causes of wastage of blood and blood components: A retrospective analysis. IOSR J Dent Med Sci 2015:13:59-61. Ghaflez MB, Omeir KH, Far JM, Saki N, Maatoghi TJ, Naderpour M. Study of rate and causes of blood components discard among Ahwaz's hospital. Sci J Iran Blood Transfus Organ 2014;11:197-206. Deb P, Swarup D, Singh MM. Two corps blood supply unit, 56 APO audit of blood requisition. Med J Armed Forces India 2001:57:35-8. Smita M, Binay B, Gopal K, Debasish M, Rashmita P, Pankaj P. Discard of blood and blood components with study of causes – A good manufacture practice. WJPMR 2017;3:172-5. Veihola M, Aroviita P, Linna M, Sintonen H, Kekomäki R. Variation of platelet production and discard rates in 17 blood centres representing 10 European countries from 2000 to 2002. Transfusion 2006;46:991-5. Veihola M. Technical Efficiency of Blood Component Preparation in Blood Centres of 10 European Countries, Academic Dissertation, Department of Public Health, Faculty of Medicine University of Helsinki, Finland; 2008. p. 5. Novis DA, Renner S, Friedberg R, Walsh MK, Saladino AJ. Quality indicators of fresh frozen plasma and platelet utilization three college of American pathologists Q-probes studies of 8 981 796 units of fresh frozen plasma and platelets in 1639 hospitals. Arch Pathol Lab Med 2002;126:527-31. Novis DA, Renner S, Friedberg R, Walsh MK, Saladino AJ. Quality indicators of blood utilization: Three college of American pathologists Q-probes studies of 12,288,404 red blood cell units in 1639 hospitals. Arch Pathol Lab Med 2002;126:150-6.